It was the last day of school for us, as some of you in my area may already know. And can I just tell you that I am so so sooo relieved to have finished my junior year. I have no idea how I managed to survive! Or maintain my GPA, for that matter! Anyways, I've been puzzling a lot on what to do about my classes next year. I've been taking classes at the college and working towards an Associate's degree and an accompanying scholarship. But if I continue next year with what I've been doing, I'll also end up sacrificing a lot. I won't be able to take some of the classes at the high school that I really care about, instead I'll be taking whatever classes at the college fit into my schedule, most of which I have no desire to take anymore. I've also been incredibly busy this year and haven't had a lot of time for the things that I really want to do, including being involved much at school. So in many ways, changing my course and focusing only on high school could be a good thing. BUT I've come so far, how can I go back on earning the degree/scholarship now? I don't know what I'm going to choose yet! But I do know what I have to do to make my decision. You see, sometimes in life we have to figure out what is worth sacrificing and what is worth fighting for. What are your ultimate goals? Are the things you are doing now going to help you to achieve those goals? Or are you so caught up in things that don't matter that you've lost sight of the big picture? Sometimes, like in my case, we don't have the big picture. I'm not exactly sure what I desire for my future. But I know that I won't get anywhere or achieve anything in my life if I'm not focused on the right things. 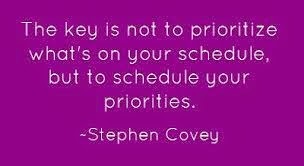 Sometimes we have so much going on in our lives that we ignore the important tasks and focus on unimportant ones. Is there anything in your life that isn't doing you good, that isn't helping you to progress toward your goals? Cut it out of your schedule! Learn to distinguish between the good and the bad in your life and work to prioritize only the activities that are doing you good. Life is forever changing! We have a lot of decisions to make! But I know that if we consider each decision and how it will affect us in the long run, we will always make the correct choice. I would invite you all to consider the activities you choose to fill your day with and ponder whether or not each of those activities is something that needs to be prioritized. I know that if we work to keep only the good in our lives and rid ourselves of unnecessary tasks, we will see ourselves progressing far faster than we ever would have otherwise. Until then, keep a good perspective and consider the things that are really worth fighting for. Have a lovely weekend, and yay for summer! P.S. You've likely noticed that I've been posting more often, but you perhaps haven't noticed my Monday-Thursday pattern. I've been trying to do a new post every Monday and Thursday, so now you know when to expect them, and I now feel a bit of an obligation so I can get myself to blog more often! I will likely be posting at night every time, but at least you now know to check in on Monday or Tuesday for a new post. Yay! Also! don't forget about my new URL! Find me at www.whatmattersmostblog.com.